Returning to live in Israel after spending many years in Canada, I had the good fortune to meet a remarkable woman with an even more remarkable story to tell. Professor Amira Eran teaches Judaic Studies at Levinsky College of Education in Israel - and for the past 2 years has headed their new International School. One afternoon I witnessed a group of students, so intensely engaged in a discussion of the Holocaust that I dared not disturb. Who were these students? They did not look Israeli - and they did not have a recognizable accent as they spoke fairly fluent Hebrew. Some had tears in their eyes; others looked down at the floor as if they needed some privacy as they were experiencing strong emotions. This was a group of 15 students from Poland, non-Jews who came to Israel to learn about Judaism, Israel, and the Holocaust. It was a transformational experience for these young Poles, but oddly enough, the meetings with their Israeli counterparts and teachers, clearly impacted the Israelis as much as the Poles. The idea of this seminar came from Professor Amira Eran, herself the daughter of a Holocaust survivor. Professor Eran told me about her family background, her motivation for becoming a scholar in Judaic studies and education and the impetus for this program, along with some unexpected outcomes. We grew up knowing that we had to somehow address this unspeakable pain as we became adults - on a personal level, with our children, and on a wider scale, with respect to our society. Perhaps that is one of the reasons I was determined to study Judaism - to gain an in-depth understanding of the roots of that heritage that the Nazis tried to extinguish. I was particularly attracted to medieval philosophy because it examines a time when Judaism, Christianity and Islam were actually engaged in close dialogue and not in conflict. I always felt it was important to share this understanding of our roots with future generations, and what better way to do this is there than to teach teachers - and that is what I do. The idea for a seminar for Polish students arose one day when Amira was visiting Poland, where she met a visionary Church Father who heads an Institute for the study of the Hebrew Language in Poland. Amira was so impressed with the motivation and commitment of these young Christian students to study and learn Hebrew, Israeli literature and culture, and about the Holocaust. It made her wonder if the grandchildren of Polish citizens who were spectators or actively engaged in the Holocaust also had some feelings that had never been dealt with. Born was the idea of a three week seminar for Polish Students at Levinsky College. “The Polish students were very interested in communicating in Hebrew. I thought that language would be the best vehicle to introduce them to Israeli culture and I tried to turn the language into a live channel of a live dialogue between real people, just as I encouraged them visit real historical places in Israel. In the end, the students told us that their visit in Israel bridged a gap between generations, and turned their ‘academic and theoretical’ knowledge of Israel into a lived experience of sharing with Israeli students, the great grandchildren of Polish Jews who had been extinguished, and the grandchildren of survivors of the holocaust – people with whom it was thought impossible to ‘build a bridge’ (Amira)”. It turned out that the program not only impacted the Polish Students. The students’ Israeli counterparts underwent a life-changing experience through their participation. Israeli and Polish students helped each other to reach the survivors. The Polish students served as a mediating link between the old Jewish survivors since they were able to speak in their mother tongue and translate for the Israeli students. Both the Israeli and Polish students documented these chilling testimonials and together created a vivid blog in which they inserted the survivors' stories. The amazing outcome of the program is the fact that this work will continue. The Polish students are going to research their families in Poland and try to locate and collect biographical reminiscences that will allow them to complete the stories that they heard in Israel. The project with Polish students is continuing. It is called “Hantzacha”, or commemoration, and it is part of the commitment to turn the experience of the Holocaust from an individual into a collective story. 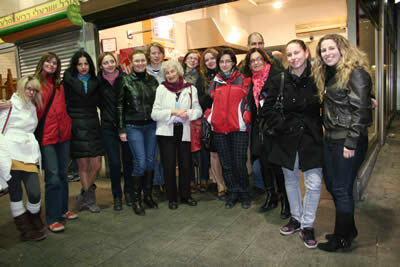 This project with the Polish students is a good example of the programs offered by Lewinsky College of Education. Their aim is to widen the perspective through which one looks at “the Other”, and to make it friendly and accepting. This philosophy guides all their international programs, whether the focus is on Early Childhood Education, Global Education, or even the Ulpan. As Professor Eran explains: “Education is an attitude as much as it is an academic discipline, and I feel that our task at the International School is to make sure no ghetto walls, theoretical or cultural, divide us from students and scholars from abroad”. Dr. Shimoni is formerly a Dean at a College in Canada and now resides in Israel and is an advisor and consultant for Post Secondary Education.